Viewers of discriminating taste (and appropriate age and disposition) who have watched The Rachel Maddow Show tackle the week's heaviest news stories may appreciate the libation and light of the show's closing Cocktail Moment. Today's Cocktail Moment includes an actual cocktail recipe... our provision of which should not be confused with us actually recommending that you drink this. Crush the small Thai chilli pepper, young ginger, Kaffir lime leaf, and lemon grass together in a shaker to bring out the aroma and flavour of the Thai herbs. Add syrup, lime juice and Smirnoff and shake well. 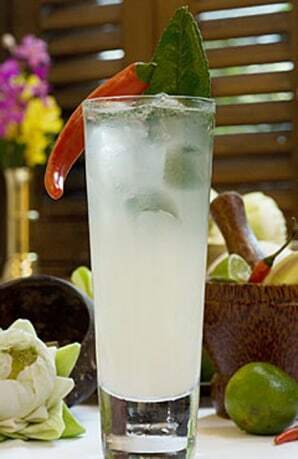 Strain into a glass with ice; top up with soda water; garnish with chilli, lemon grass and a slice of lime.